Formulated from a high concentration of pure, north Brazilian carnauba, natural luxury oils and the finest blend of ingredients, Muc-Off Über Wax changes the rules when it comes to deep gloss protection so be prepared for a show winning shine! The only thing more amazing than the shine it gives your car is just how easy Über Wax is to use! Despite having such a high percentage of carnauba wax, Muc-Off Über Wax is almost effortless to apply and buffs off smoothly to reveal an unrivalled deep gloss and protective concours finish. 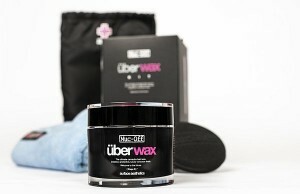 For more information, please visit: http://muc-off.com/en/car/58-uberwax.html?category=car ENDS. Print article This entry was posted by admin on August 16, 2012 at 2:43 pm, and is filed under News. Follow any responses to this post through RSS 2.0. Both comments and pings are currently closed.